plus tax and $3.00 shipping. The book preview uses Flash technology. Please download Flash Player and try again. Click and drag page corners to turn the pages. Many parents visit a minimum of three doctors before finding a correct diagnosis for the symptoms their child is suffering. When Nick Schmitz was 6 years old (he's 7 now), he was diagnosed with celiac disease. That diagnosis lead to a big change in Nick's eating habits - a change the made Nick feel a lot better. He stopped having so many tummy aches, and started growing a lot faster. And when he learned how the disease affected his body, he wanted to share that information with other kids who have celiac disease. He and his mom decided to write a book to help other kids understand how celiac disease affected their body, and their ability to absorb the nutrients in food. As Nick said, "We couldn't find a book with cool pictures to read, so we thought we should write one to help other kids understand all this better." 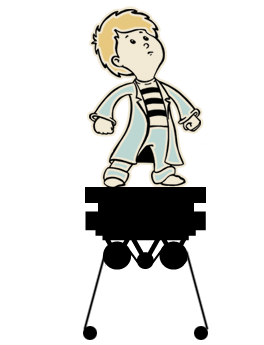 In Nick and the Shrinking Inner Spaceship, our boy scientist super hero takes readers on an amazing journey. Nick shrinks himself and his favorite spaceship so he can explore his little brother's intestines for signs of celiac disease. He and the readers learn how celiac disease actually affects the body. But don't worry, everything comes out in the end. Having celiac disease doesn't mean you have to give up your favorite foods - you just have to get creative in how you prepare them. Here are some of Nick's favorite gluten-free recipes. Some of them are so fun and easy, that kids can help with the cooking! Celiac disease is a genetic disorder affecting children and adults. Celiac symptoms were noted as far back as the first century AD. Charlie, like every younger brother, was overjoyed to be the object of Nick's experiment. He's a healthy four-year-old and follows his big brother around everywhere. No one is sure why celiac disease happens, but it appears to run in families. That's why Nick wanted to find out if his little brother might have Celiac Disease - even though Charlie didn't show any symptoms yet. There is a 5% to 10% chance of getting celiac disease if someone in your family has it. It's especially common in people from the northern European countries and the United States. How common? About 1 in every 133 people in the United States has celiac disease. Obviously, many people who have celiac disease do not know it. If all these people were diagnosed, celiac disease would be more common than Type 1 diabetes. Fortunately, awareness is growing about the problem, and there are better ways of testing people for it. Celiac disease is also known as gluten intolerance. In the USA there are 2.5 babies born every minute with the genetic makeup to have celiac disease. 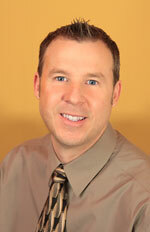 In 2003 Doug Moss opened his own marketing/design firm with his partner Candy Van Dam. Insight Marketing Design has had a positive impact on the community by strongly supporting children's causes and the arts. The full-service advertising agency is located in a renovated warehouse in downtown Sioux Falls. 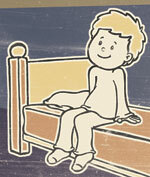 This is the fifth children's book that Doug Moss has illustrated. Doug received his degree in fine arts from Miami University of Ohio with concentrations in graphic design and illustration. He has spent his career in the world of commercial art, working as a designer and an art director. His day job is Creative Director/Principal at Insight Marketing Design. After winning many national awards for his commercial art and illustrations, Doug was honored to have two illustrations selected for exhibition in the Society of Illustrators gallery in New York City. Currently there are no drugs available to treat celiac disease. 100% of little boys think that flatulence is funny. 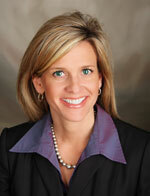 Antibody blood tests are the first step in screening for Celiac Disease. The antibody blood test will show if the system is responding negatively to gluten. 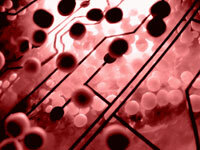 The antibody test is a newer technology. Because it's less invasive than previous tests, more people are having the initial screening performed - and more people are being identified as having Celiac Disease. If the antibody blood test is positive, the next step is doing an endoscopy to obtain biopsies, as this is the gold standard to confirm celiac disease. 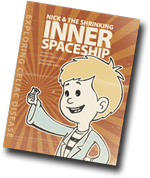 I hope all of my patients with celiac disease have the opportunity to read "Nick and the Shrinking Inner Spaceship." A new diagnosis of celiac disease can be overwhelming for a family and this book is a great resource to help young children understand what it means to have celiac disease and why it is so important to follow a strict gluten-free diet. Nick and his family share this story for other children and their families to read - it is a well-written and beautifully illustrated book that has a positive message for children with celiac disease. I'm glad to have had the opportunity to be involved! The National Foundation for Celiac Awareness (NFCA) was formed to raise awareness of celiac disease and to facilitate research and treatment of the disease. NFCA is affiliated with the leading researchers with the goal of improving the quality of life for those who have celiac disease. $1 from every sale of Nick and the Shrinking Inner Spaceship will be donated to NFCA.